Support sales efforts, lead flows, pipeline with marketing automation. 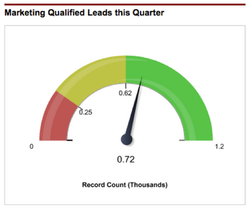 GOAL: align sales and marketing with a lead flow process that increases conversion and efficiencies. Marketing and Sales together designed, tested and implemented an entire lead flow process from new lead, non-responsive, nurture, MQL, SQL, Opportunity to Closed Won/Loss. From automated task to trigger based lead flow movement. Marketing automation was set-up to deliver high quality leads to sales at the right time in the buyer journey. Personalized, relevant email throughout the buyer journey designed to support sales efforts by engaging customers with the right message and the right time.